This is what all you fans have been waiting for! Pakistan T20 kit patch 2014 for Don Bradman Cricket DBC 14. The most awaited kit is now available for download. This Beautiful Kit has been done by Shailesh Kumar (Follow him on Twitter @A2Shailesh). The Amazingly beautiful Kit will be delight to watch in game. So dont wait more, just download it now! 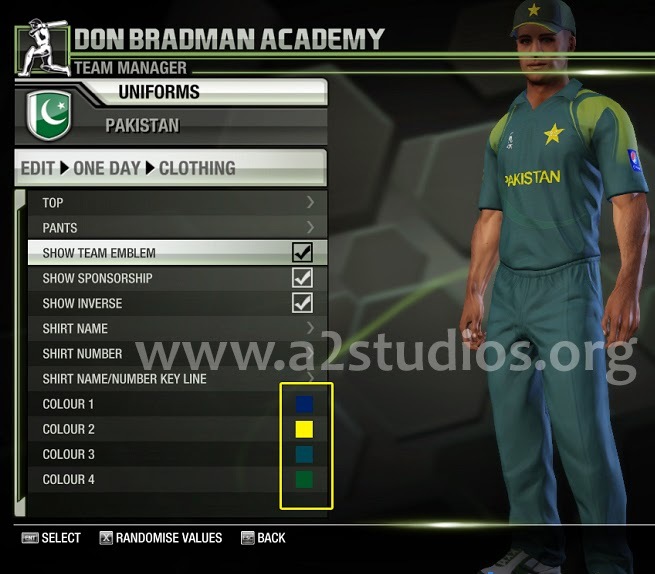 Download Links attached along with instructions on how to customise this kit in Don Bradman Cricket Academy Team Manager. Copy "pattern_12_col" to "\Documents\My Games\Don Bradman Cricket 14\textures\characters\tops\Modern_01” Paste it. Copy "pattern_00_col.dds" to "\Users\XXXX\Documents\My Games\Don Bradman Cricket 14\textures\characters\pants\Current_00". "uni_hirotrac_dark" to "\Users\XXXX\Documents\My Games\Don Bradman Cricket 14\textures\characters\sponsors". “f_pakis" to "\Users\XXXX\Documents\My Games\Don Bradman Cricket 14\textures\characters\emblems". 6) Launch Don Bradman Cricket Academy, go to "Team Manager" and select "SRILANKA (Current Generation)". 7) Select "Identity" and make sure you have the team sponsor set to " hirotrac_dark ". Set the Top Model to "Modern01" and pattern to 13. Set the Pants Model to "Current 01" and pattern to 01.